Here’s your place for post-event coverage of Commencement 2012. Check back often as we’ll be adding, stories, photographs and video hour by hour throughout the weekend and next week. Bonnie Bassler, molecular biologist and first of three honorary degree recipient to address the Class of 2012 at Commencement, proves to be a hard act to follow for Robert De Niro (seated, left) and Gwen Ifill (center). Interim President Nancy Cable is at right. Photograph by Phyllis Graber Jensen. 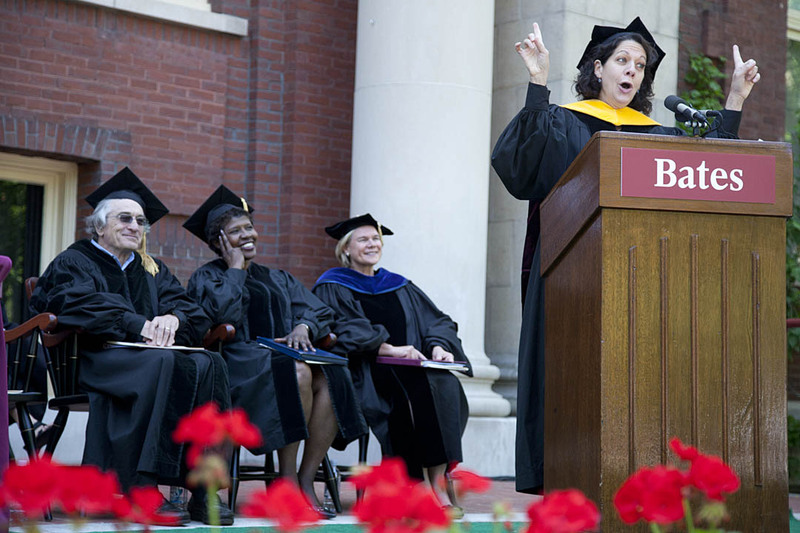 Great advice, humor infused with spot-on Bates lore and the requisite brilliant sunshine helped Commencement speakers and honorary degree recipients Bonnie Bassler, Robert De Niro and Gwen Ifill wow this year’s Commencement throng. At Commencement, alumni and their children graduating with the Class of 2012 talk about their shared sense of Bates. A Commencement slide show with traditional processional music performed by the Portland Brass Quintet. See more Commencement 2012 photographs on the Bates Flickr site. Watch a video of the annual honorand panel discussion featuring Bonnie Bassler, Robert De Niro and Gwen Ifill. Moderated by Professor of French Kirk Read and held in the Olin Arts Center Concert Hall the evening before Commencement. Transcripts of Commencement remarks by honorary degree recipients Bonnie Bassler, Robert De Niro and Gwen Ifill. The complete video of the ceremony is now posted. Read the citations that illuminate the 2012 honorary degree recipients Bonnie Bassler, Robert De Niro and Gwen Ifill. 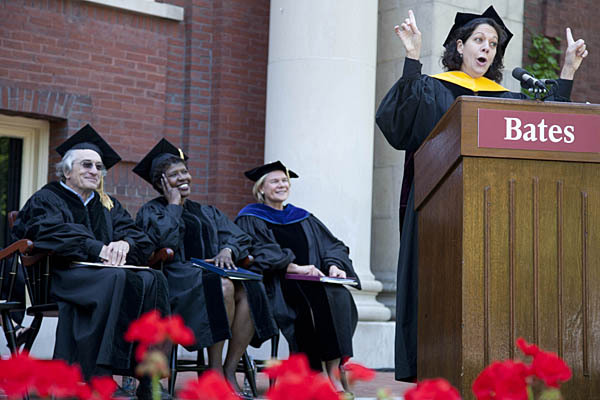 Learn about the 2012 Commencement speakers, Bonnie Bassler, Robert De Niro and Gwen Ifill. The Class of 2012, who they are, where they’re from, what they studied. Members of the Class of 2012 started a new tradition on May 25 by forming the numeral “2012” on Garcelon Field. Watch a time-lapse video as they line up for their downloadable senior class photo. Congratulations to the Bates Class of 2012! At Bates, we look forward with great anticipation each year to honoring our graduating seniors and welcoming their families and friends to campus over Memorial Day weekend. We share in the excitement and joy about the graduates’ achievements at one of the world’s leading colleges of the liberal arts and sciences. Our celebration is actually a series of events beginning late Thursday and continuing through Commencement exercises on Sunday morning — and a little beyond. Below is the full schedule. If you’re planning to join us, we hope you’ll visit this page again before arriving on campus, as plans sometimes change a bit along the way. Click Here for Cap and Gown Distribution for Seniors. 5:30 – 7 p.m. Senior-Faculty Farewell Celebration. Alumni Families and their Graduates!